Off-roading can be stressful as you drive your way through rough, rugged, and uneven terrains. There’s always a chance that your vehicle will need some help to get through it. Investing in a winch is a good move if you plan on driving on these terrains even when the weather is unfriendly. Winches are one of the essential devices when it comes to pulling your truck out of mud or hole or a buddy out of a tough situation. Not having a good winch could spell the end to your off-road adventure. Finding the best product in today’s market is not an easy one. We dedicated some time in researching and testing the top-selling winch to find out which one provides the best value based on performance, quality, price and other relevant factors that affect usage. We then narrow our research down to the best overall winch in our review. 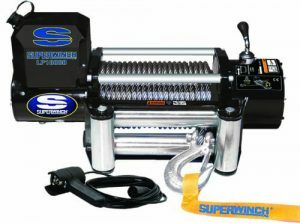 We are happy to recommend the Superwinch Terra 2500-3500-4500 lb Winch to all our readers. The Superwinch Terra 45 winch is designed to provide compatibility, versatility, high-end power and durability for customers searching for the best product. This winch is best for almost all utility cars. The winch features a three-stage planetary gear train, a 3,500lb pull rating, oil pocket bronze bearings, a four-way roller fairlead, 50-feet of durable steel wire rope, a 1.6 horsepower low-amp engine, multiple operation switching options and other exceptional features making it suited to work in any condition you find yourself. The Superwinch Terra 35 is quite reliable and has high power for heavy-duty work on harsh terrain. The device delivers the highest performance to haul out your vehicle from any tight spot you may find yourself. The winch is compatible with the most all terrains vehicles. The 4500lb Winch is fit almost every power sports ride on the market today. Unlike other products in the market, the planetary gear is as twice powerful as those used by other manufacturers. The product guarantee smooth and uncompromised performance no matter the terrain and weather condition. A good winch should be able to withstand adverse weather and all the harsh outdoor elements. The Superwinch 4500 does not disappoint you in this area. The winch features a well-sealed 12-volt DC motor capable of operating and withstanding extreme weather condition. This winch is well built to withstand dust, rain or snow. Additionally, the winch ensures you get enough power capable of hauling your truck out of the mud, hole or sand. The motor comes with a high 5.2 HP capable of pulling 9,500 pounds of weight. Hauling a heavy-duty truck can be very risky. The Superwinch Terra winch allows you to operate the device at a safe distance of about 12 feet. The handheld control remote will enable you to have full control when pulling a massive object. The remote is easy and straightforward to operate with a friendly interface that allows you to gain complete control over the pulling process. The Superwinch Terra 35 winch is not just an ordinary device. The tool is well designed with high-quality materials. The free level ensures a better grip during pulling and lifting. The art of state designs delivers functionality as well as performance. This device provides peace of mind during pulling or lifting of objects. The Super winch functionality ensures you have confidence when driving your heavy-duty trucks. The Superwinch Terra 25 winch is quite lightweight for the performance it renders. It weighs in at 20.1 pounds and has an overall dimension of 13.4 x 4.5 x 4.8 inches. The device can be used in areas where there is no power supply while it can also operate on DC. Every product has its advantages and drawbacks. The Superwinch 4500 is no different. Below, we highlighted the pros and cons for you to decide if the product is what you need. Customers review is one of the best ways of knowing how a product performs. Several online platforms provide Superwinch terra 45 reviews. But we based our analyses on one of the most reliable sources: Amazon. At the time of writing this review, this product has several customer reviews. Based on those reviews, the Superwinch Terra 25 has an impressive rating. The product is one of the few highly product on the market. We discovered that most customers are pleased with the design, quality and the sheer power. According to them, the wrench makes pulling and lifting tasks much easier. The price is within the average range for budget conscious customers. We tend to agree; this product performs beyond expectation. After weighing the performance of Superwinch terra 25 with other products in the market, we can boldly say the product is a good buy for its price. The device is compact, durable and portable. The winch is easy to operate in any weather condition. This device receives massive praise due to its ergonomic design, performance and sheer ease of use, though the product is not the cheapest in the market but the price and performance worth every penny. The product receives few negative reviews that are mostly based on mounting plate and installation which is also common in other products. We highly recommend the Superwinch Terra 45 for customers looking for the best lifting and pulling winch.